I took some step-by-step photos of a new oil painting and thought you might like to follow the painting process. Click images to enlarge. 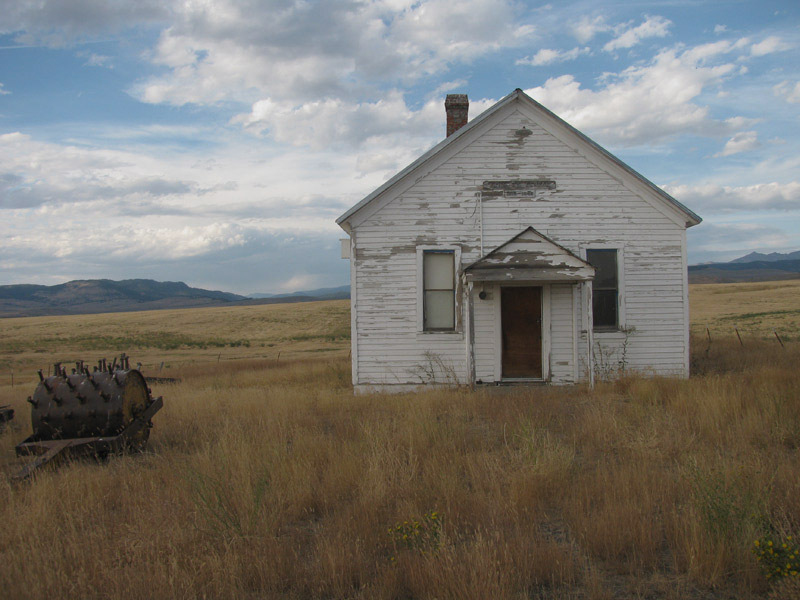 Here's the photo reference--a one-room schoolhouse I came upon about 20 miles from my home. I loved that brilliant, late-afternoon sky with the building in contrast against it. I chose a long narrow format for the design, to emphasize a panoramic feel. I'm working on a 1/4" Masonite hardboard panel primed with three coats of acrylic gesso, applied with a foam roller and then sanded to a fairly smooth but still somewhat toothy surface. 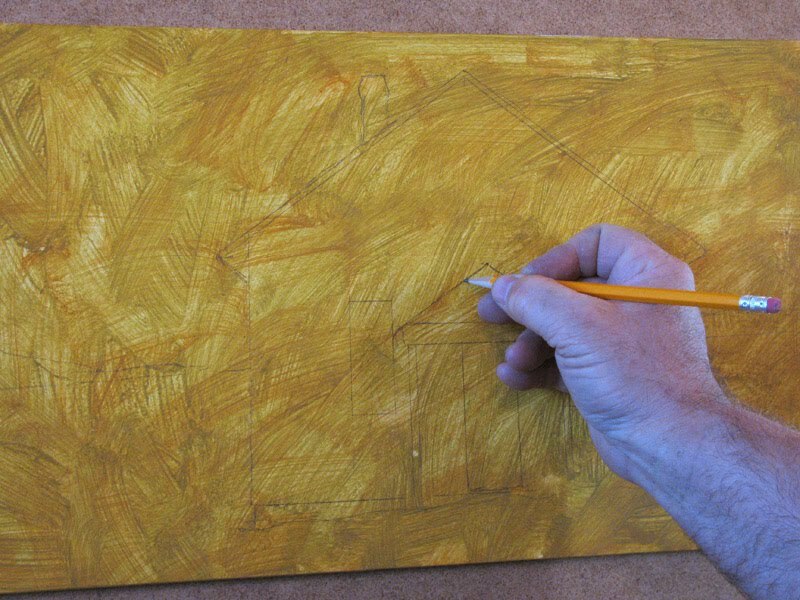 I've loosely scrubbed on a thinned acrylic undertone with raw sienna. When it is thoroughly dry I begin laying in the lines with a #2 pencil, trying to be pretty accurate with proportions on the building. 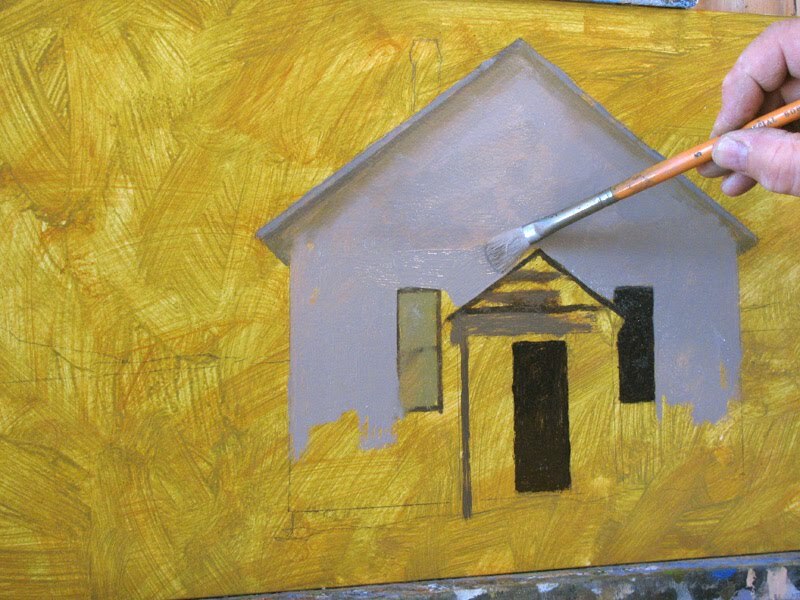 Here I begin blocking in the basic building, using an Isabey #5 natural bristle flat. The white wall will be in shadow against the sky. I'm taking a stab at getting in the ballpark for both color and value, with mixtures of white, ultramarine, raw sienna and burnt umber. I rarely pre-mix piles of color, preferring to mix brushloads at a time. Color is mixed intuitively rather than by theory...a bit of this...a dash of that. A little Liquin medium is used in the mixtures. Laying in the sky with the same brush, working as quickly and directly as possible. I follow the cloud patterns in the photo fairly closely, since that is what drew me to the subject in the first place. However, I make some fairly subtle changes to their shapes, orchestrating the design to "fit" the painting better and create a sense of expansiveness within the long format. 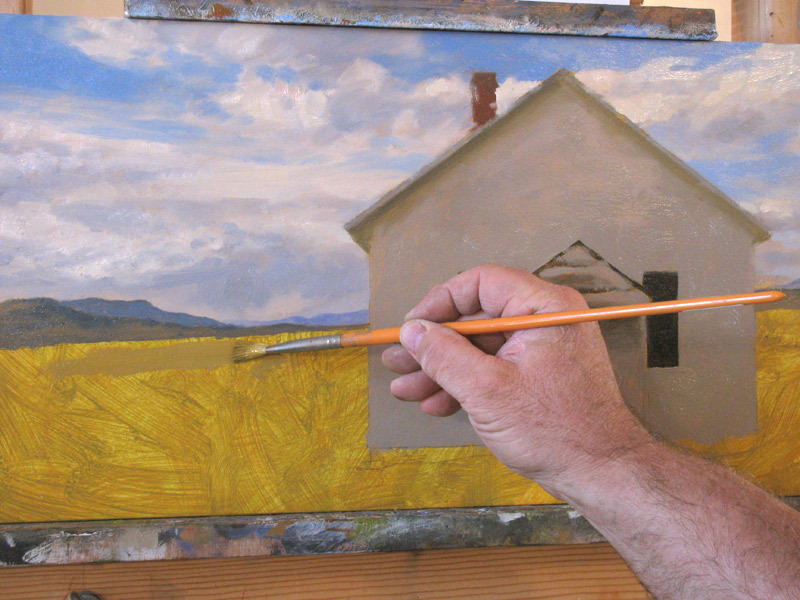 I want to maintain vitality in the brushwork, so I try not to fuss around the edges of the building too much. I will come back later and sharpen where needed. I believe that the years of doing daily paintings, as well as my background in mural work, have given me greater confidence to work directly and with a certain pace. Beginning the middle and foreground areas, using mixtures of white, cadmium yellow light, raw sienna and burnt sienna. Once the environment around the building is roughed in, it becomes clear that the school is a little too dark in value. 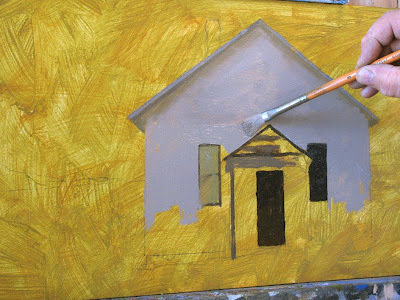 I scumble over it with lighter, Liquin-heavy mixtures of the same colors used initially. I'm not trying to refine it to a perfectly even tone, I want some of the undercolor to modulate through. Here's the surface after value correction. I'll post the completion of the painting in the next post. That is great.Thanks for taking the time to show a step by step.I am now waiting to see the end result. Thank you for letting us in on your process, Don. I love the 'quiet' of this piece, though it is fun to imagine the olden days when the kids played outside at recess! What a wide beautiful space to go to school! OOh, what a tasty treat is this post! Thanks very much for posting your process, Don. I devoured your every word and picture, wonderful!! Like everyone else, I'm loving the process and look forward to the next chapter. Paintings in progress are my favorite books. Thanks, Tanner--good to hear from you. Hello Rahina, I always appreciate your comments. I'll join the chorus. The process pics are really good. Thank you. Can't wait to see the finished painting. 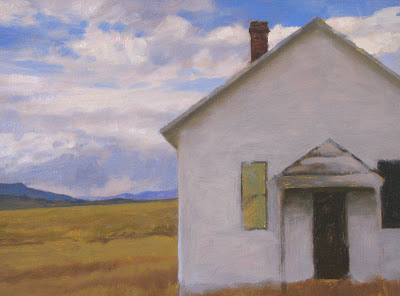 It promises to be a piece of Americana with the souls of Hopper and Wyeth in attendance. Love this work in progress! I've never been brave enough to try oils. It's fun to see how the process works. 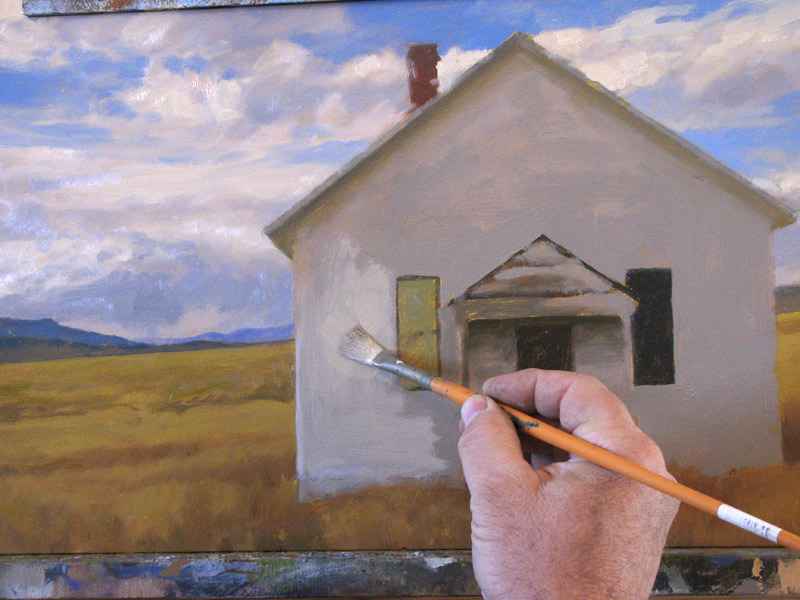 Do you use the base coat of raw sienna to give the painting more depth of color? Caio, thank you. I appreciate your art and writing. Hello there, Sam. The pressure's on now...hope I don't spoil the ending--I could write a book on how many times I've done that! Hi Shirley--thanks for tuning in. 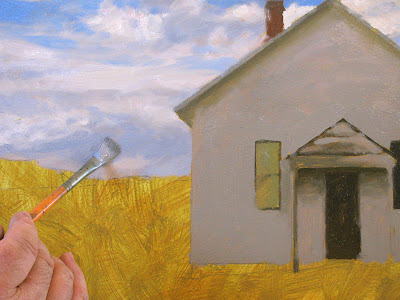 You're right, the painting is shaping up to be one of those that shows my earlier influences...what's a fellow to do? 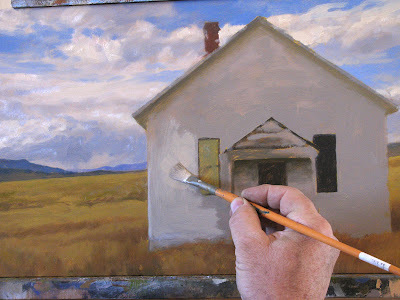 Don, you are very generous to share your process and what a lovely painting is emerging! I'll be certain to check back in for the finish. I also was intrigued by your previous post including the video of your studio. What an interesting story of your leaving it years ago and your returning. The space is so spacious, magical and inspiring to say the least. Marilyn--thanks so much. I'm glad you're enjoying the posts. You do very fine work. DONNNNN killer sky!!! Wish I could paint like you! Love everything about this painting! Yes I am browsing through your archives, I've too much! :( Your blog and art make wonderful art vitamins for my own art's goodwill :) CHEERS!